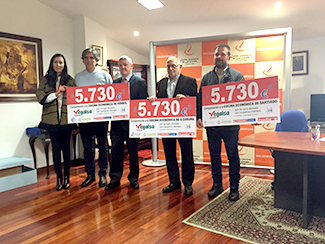 The collaboration between the Galician food distribution company and Vegalsa-Eroski Foundation has made it possible to deliver this week a contribution of close to 17,200 euros to A Coruña, Santiago and Ferrol Economic Kitchens. The management of more than 365 tons of used clothing and shoes collected in 2015 in the containers installed by Humana in 60 establishments Vegalsa the Eroski / Center and Family Galicia, Asturias and Castilla y León brands, has made it possible to obtain the resources necessary for this contribution. This initiative is a clear example of how the proper management of used clothing results in social aid in Spain and other countries, reversing in people who have less. At the ceremony, held at the Economic Kitchen Coruna, they were attended by representatives of the Economic Kitchen Galician Jose Antonio Pinon, Jacinto Torres and Javier Brage, besides the director of External Communications, CSR and Customer Area Vegalsa- Eroski, Gabriela Gonzalez, and the Head of National Promotion of Humana, Gustavo Pampín. The partnership between Velgalsa and the Foundation has allowed a similar action in Asturias. So, this week has delivered a contribution of 1,295 euros to the Food Bank of Asturias, which has been earmarked for the purchase of essential goods for their users. The ceremony was held at the Family Supermarket Oviedo, in the presence of Maite Iglesias, responsible for Supermercados Familia, Bernardo Sopeña, from Food Bank and Ricardo Rodriguez, Head of Collecting Humanain the Principality.